Last week, I ordered some spices from my favorite spice shop (Penzy's), and they sent me a sample of their Bangkok Blend seasoning complementary with my order. I was pleasantly surprised as I hadn't requested this particular free sample (I had requested the free sample of their roasted garlic seasoning, which I also received, but I digress). The jar said it was for fish chicken and vegetables, and its ingredients were "ancho chili pepper, garlic, ginger, black pepper, galangal, crushed red pepper, lemon grass, cayenne, paprika, basil, cilantro". Since I had already prepped some chicken thighs for dinner and had planned on serving some kabocha squash as a side, I figured I'd try it on the squash. See the recipe for the squash after the jump. To start off with, I like to prep a whole squash on one day and store the rest in a container with a secure lid for future use. Since it's just me and the hubs, I rarely get through a whole squash in one meal. Disclaimer: I have no idea if this is an ideal way to store squash, I just know that it usually lasts a few days up to a week the way when I've done it. Side note: I forgot to take a picture of the whole squash, but as an FYI, this is a kabocha squash; click here. Also, this is one of the only squashes that the hubs finds palatable. 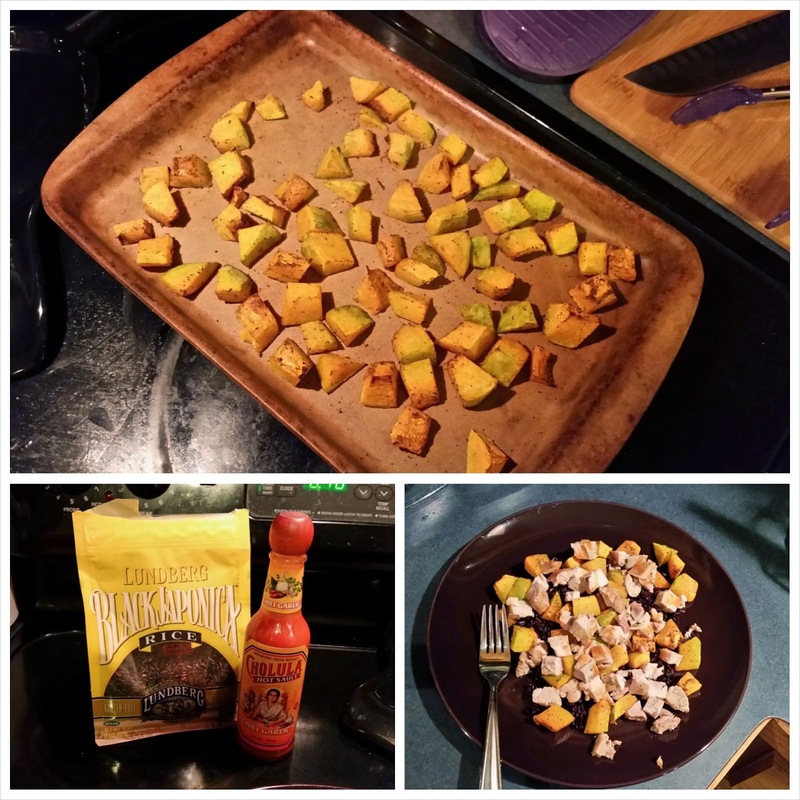 He likens it to a sweet potato in flavor more than a butternut squash flavor profile. Before beginning my prep, I set the oven to preheat at 400°F. I usually begin my prep by chopping said squash in half, scooping out all seeds and pulp, then peeling it. I then chop it up in to large pieces that will fit in my container of choice. I weight out about 300 g -500 g of squash for 2 servings depending on the meal plan. I store the rest in a well sealed container in the fridge (see lower left image in Figure 1). After storing the left over squash, I chop up my weighed out squash into bite size pieces. I used approximated 300 g for this recipe. As I'm chopping, I place the pieces onto my baking pan. My baking pan of choice for squash and other root vegetables is a stoneware baking pan from the Pampered Chef (see top image in Figure 1). Once all the chopping is finished, I sprinkled on a shaking of the Bangkok Blend and tossed to coat. Then I gave the squash a few good sprays with some coconut oil spray (see lower right image in Figure 1) and tossed to coat. To save on dishes, I will often just do my seasoning and mixing directly in my baking dishes. Figure 1: (From top, clockwise) Chopped squash in baking pan, Coconut oils spray and Bangkok Blend sample, left over kabocha ready for storing in fridge. After the squash is mixed up well and the oven is preheated, I bake the squash for 20-30 minutes. The variance usually depends on how coordinated I am with preparing the other components of the meal that day, or how hungry I am. The finished product on this particular day was after closer to 30 minutes (see top image of Figure 2). Figure 2: (From top, clockwise) Cooked kabocha, accompaniments for meal, assembled dish. On this particular day, I decided to serve up the squash with chicken thighs, as I mentioned. I also wanted to try this black rice I found (see lower left image in Figure 2). For the entire meal preparations, the timing was something like this: set up black rice in rice cooker. Preheat oven to 400°F. Prep and start baking chicken thighs (recipe below). While chicken thighs bake, prep and bake squash. Chicken thighs will be done a bit earlier than squash, so remove from oven and let stay warm on top of oven or in microwave. When squash is done, remove from oven and assemble dishes. Drizzle with a bit of Cholula hot sauce for extra spiciness (see lower right image in Figure 2). The whole meal probably took about 45-60 minutes, but using the leftovers the next day was much quicker as the chicken was just nuked in the microwave and the squash was mostly prepped already. 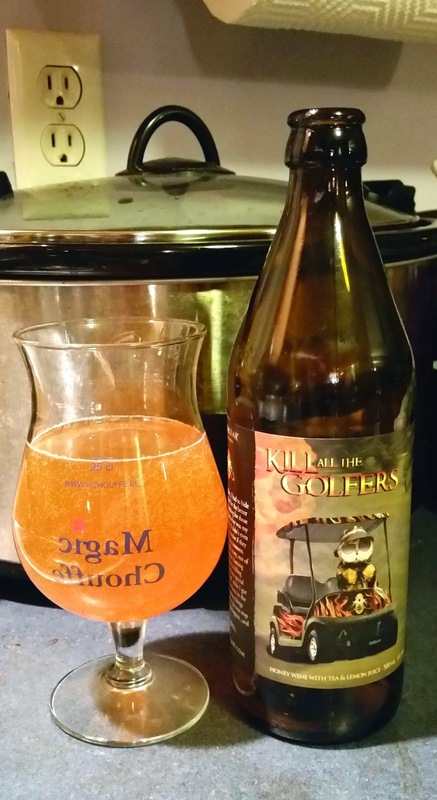 As a final note, I want to take a moment to shine a light on my beverage of choice to complement the meal, Kill All the Golfers from B. Nektar Meadery (see Figure 3). I like to drink it in a Magic Chouffe glass because it has a 25 cl mark on it which divides the bottle in half exactly. It is a honey wine with black tea and lemon juice infusion. I find that it complements the sweetness of the squash nicely and the earthiness of the black rice. Figure 3: Beverage pairing for meal. If you just want to print out the recipe, I've included a summary version below for the squash and the chicken. Chop up peeled kabocha squash into bite size pieces. If squash is not peeled, prep by cutting squash in half, removing pulp and seeds, then peeling with vegetable peeler or sharp knife. Place chopped up squash into baking pan and sprinkle with seasoning. Toss to coat. 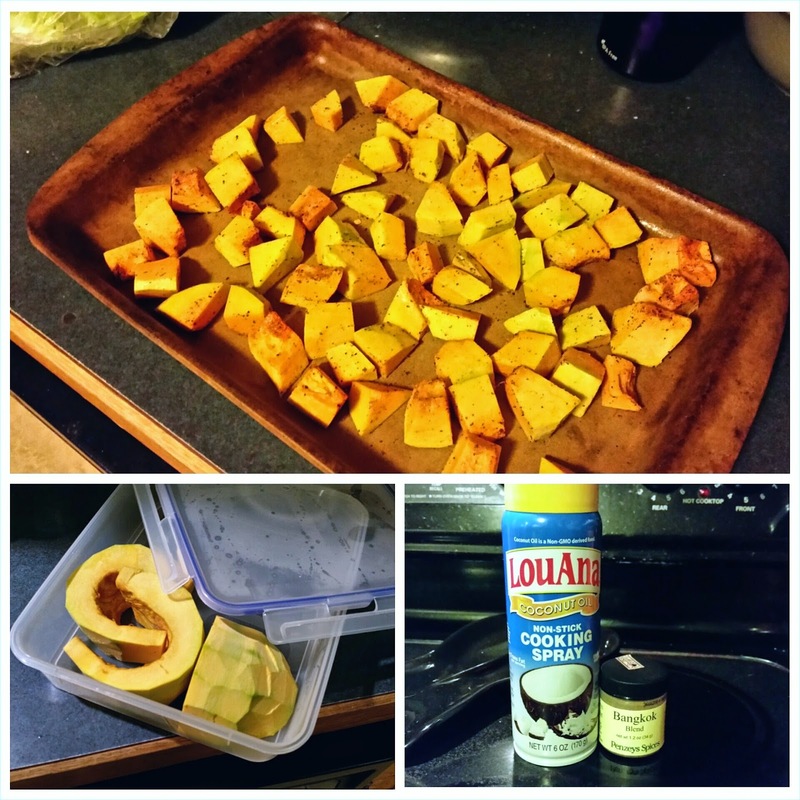 Spray seasoned squash with coconut oil, and again toss to coat. Place pan in oven for 20-30 minutes. Serve with accompaniments of choice. Season chicken on both sides with spice blend and salt. Place seasoned chicken into baking pan. Place pan in oven for 30-35 minutes. I usually check that the internal temperature has reached 165°F before serving.